For the train known as The Deerstalker, see Caledonian Sleeper. For the stalking of deer, see deer stalking. A deerstalker is a type of cap that is typically worn in rural areas, often for hunting, especially deer stalking. Because of the cap's popular association with Sherlock Holmes, it has become stereotypical headgear for a detective, especially in comical drawings or cartoons along with farcical plays and films. The deerstalker is most often made of cloth, often light or heavy wool tweed, although deerstalkers made of suede, white cotton duck and even denim are not unknown. The cap is made of six (or eight) triangular panels with rounded sides which are sewn together. If the sides of the panels are cut in a way giving them slightly rounded shoulders midway, the crown will become more squared and flatter rather than hemispherical. The cap may be deep or shallow, barely touching the tops of the ears, according to the whim of the hatter. Either way, it is usually lined with an inner cap of satin, polished cotton or similar lining fabrics. Occasionally one can find a deerstalker with a lightly quilted satin lining. The deerstalker's main features are a pair of semicircular bills or visors worn in front and rear. These are usually stiffened with pasteboard, cardboard or layers of heavy canvas. For a brief, unfortunate, period during the 1970s, some deerstalkers were manufactured with bills stiffened by the steam-cooked and pressure-molded wood fiber construct called Masonite. It was a bad choice since the Masonite tended to crack and break into segments. Over time, the Masonite insert was also apt to crumble at the corners. Along with its visors, a deerstalker has a pair of unstiffened cloth earflaps attached to either side of the cap. These are tied together by grosgrain ribbons or by laces or, very occasionally, held together by snaps or a button. The dual bills provide protection from the sun for the face and neck of the wearer during extended periods out of doors, such as for hunting or fishing. The earflaps, tied under the chin, provide protection in cold weather and high winds. They are otherwise tied together above the crown to keep them out of the way. Deerstalkers may be made of solid-coloured material, but they are most often found with houndstooth check, herringbone, or plaid patterns in the twill of a fabric which serves as camouflage. Modern hunting clothes, including deerstalkers, are often made with either a red-and-black or an orange-and-black check pattern or tweed for both this purpose and hunter safety, not least in actual deer stalking, for which purpose milliners originally constructed[when?] this type of cap. The "sportsman's deerstalker" is made with a narrow brim attached to the cap instead of the usual double bills. The earflaps are eliminated as well. Some types of this cap sport a belt fashioned from the same material around the crown. This version is seldom worn by hunters. It is, however, much favoured by fishermen. The variants of the "Irish" style deerstalker are minor but significant. The cap is fronted with a cloth panel instead of the usual seam. The earflaps, wide and triangular in the standard version, are narrow with straight sides. The usual semicircular visors may be replaced by short, rectangular bills, George C. Scott wore this type of deerstalker as a jurist who imagines himself to be Sherlock Holmes in the 1971 film, They Might be Giants. Another type is a cap made of heavy cloth with paired earflaps, sometimes lined with fur or lambskin, and a single visor in front. A cloth band turned up in the rear that can be lowered to protect the back of the neck takes the place of the rear visor. An exaggerated version of this type of deerstalker is often seen in cartoons, such that worn by Elmer Fudd when he's hunting "wabbits". Yet another variety is the flat cap, newsboy cap or golf cap featuring paired earflaps snapped or buttoned together with, again, a single visor and a matching cloth band in the rear that can be turned down along with the earflaps. There is also a reversible deerstalker. It looks like the standard, double-billed model but it can be turned inside out, revealing an entirely different fabric or even suede, with the contrasting earflaps of the original fabric turned backward and tied together. The deerstalker cap is also known as a "fore-and-aft" cap in reference to its front and rear bills. This headgear is also called a "tweed helmet," due to its resemblance to the basic design of the Balaclava helmet worn by British soldiers during the Crimean War. Due to the band Thee Headcoats who, along with their fans, made a habit of wearing the cap it is sometimes called a headcoat. 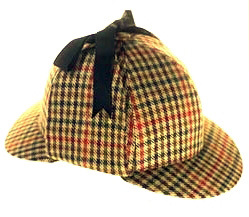 The most famous wearer of a deerstalker is undoubtedly the fictional character Sherlock Holmes, who is popularly depicted favouring this style of cap. Holmes is never actually described as wearing a deerstalker by name in Arthur Conan Doyle's stories, though. However, most notably in "The Adventure of Silver Blaze", the narrator, Doctor Watson, describes him as wearing "his ear-flapped travelling cap", and in "The Boscombe Valley Mystery", as wearing a "close-fitting cloth cap". As the deerstalker is the most typical cap of the period matching both descriptions, it is not surprising that the original illustrations for the stories by Sidney Paget (who favored a deerstalker himself) in Great Britain, and Frederic Dorr Steele in the United States, along with other illustrators of the period, depicted Holmes as a "deerstalker man", which then became the popular perception of him. Later, less-informed depictions of Holmes have him wearing this cap in the city, failing to take into account the fact that the fashion-conscious Holmes would be loath to commit such a sartorial faux pas; the deerstalker is traditionally a rural outdoorsman's cap. It is not appropriate headgear for the properly dressed urban gentleman. Still, while contemporaneous illustrators portrayed Holmes as wearing a deerstalker in the proper setting for such attire, travelling cross-country or operating in a rural outdoor setting, Sidney Paget chose to depict Holmes as wearing the deerstalker in London while keeping vigil for the appearance of the murderous Colonel Sebastian Moran in illustrations made for "The Empty House" when the story first appeared in Strand Magazine in 1904. This is uncharacteristic of Paget who most often depicts Holmes wearing a black top hat and frock coat in the city, as shown in the Regent Street scene in The Hound of the Baskervilles, or sporting a black bowler when wearing a black or plaid Inverness cape (or, more accurately, a macfarlane cape-coat) as seen in his illustrations for "The Blue Carbuncle" and "The Musgrave Ritual" respectively. It has been supposed that Holmes' indiscriminate use of the deerstalker cap occurred because of the popularity of the two period films from 1939 in which Basil Rathbone starred as Holmes, The Hound of the Baskervilles and The Adventures of Sherlock Holmes. This is erroneous. In both of these films Holmes is shown properly wearing the deerstalker in the countryside or in a rural setting. That Sherlock Holmes has been frequently depicted wearing a deerstalker regardless of setting, was popularised in the United States by the pastel and line drawings of Frederic Dorr Steele whose illustrations of Holmes wearing the deerstalker were created for Collier's Magazine and other periodicals. Steele based his concept of Holmes mainly on photographs of the actor William Gillette, who had become hugely popular as a portrayer of Holmes during the first third of the 20th century. Gillette had worn a deerstalker in his stage play which first ran in 1899. It was left to Steele's influential drawings to popularise Holmes as wearing a deerstalker so that the cap became synonymous with the detective. Wikimedia Commons has media related to Deerstalkers (headgear). Look up deerstalker hat in Wiktionary, the free dictionary. ^ Osborn, Michael (25 December 2009). "Sherlock Holmes ditches his deerstalker". BBC News. Retrieved 27 January 2012.